Andrew Siwicki ’14 may have the best job description ever: He makes robots dance on national television. Well, that’s not all he does. Not even close. 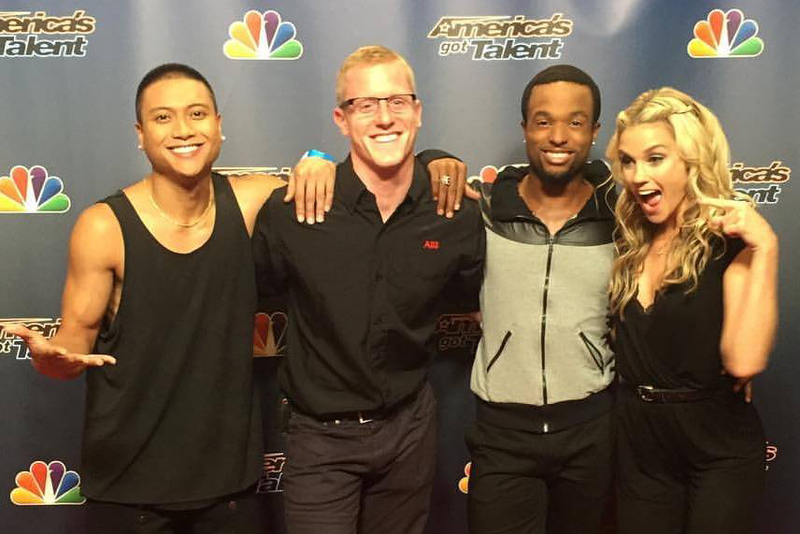 But just one year after graduating from Illinois State, Siwicki just took his industrial robotics expertise onto NBC’s America’s Got Talent, where he teamed up with dance group Freelusion for a stunningly choreographed routine. It was a career high—in a very young career. “From programming the robot routine and applying the necessary safeties, I would have never thought I would be this far in my career,” said Siwicki, a Momence native. Siwicki traces his early success back to his education in Illinois State’s Department of Technology, especially its faculty and Caterpillar Integrated Manufacturing Laboratory. 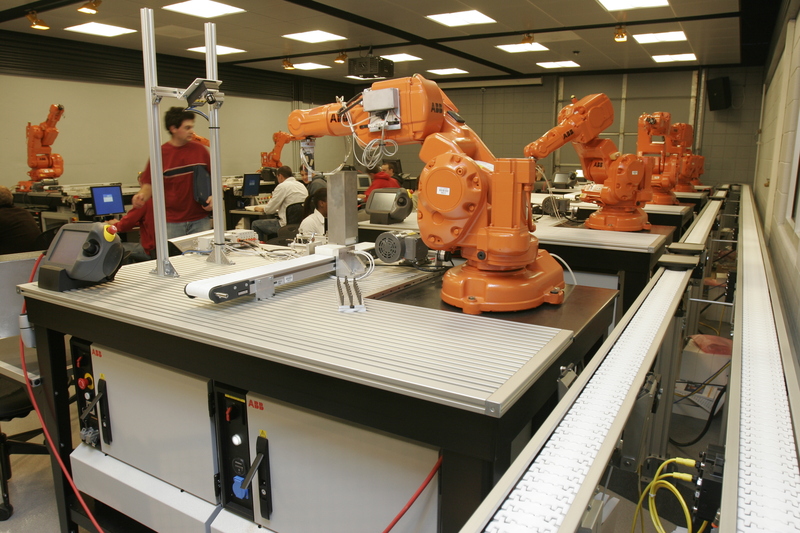 Siwicki worked in the lab, which has 10 state-of-the-art ABB industrial robots and a wide array of related equipment for student use. Illinois State alum Andrew Siwicki ’14, second from left, with Joshua Sean, Laura New, and DJ Smart from the Freelusion dance group. “It’s a pretty special space. It’s a showcase for us,” said Department of Technology chair Ted Branoff. Siwicki majored in renewable energy, with a minor in engineering technology. He graduated early, but already had a job lined up at ABB, the same company that produced ISU’s robots. When he’s not making robots dance, Siwicki is a robotics engineer and paint specialist at ABB. That means he’s in charge of the robots that precisely paint most of the cars you see on the street today. He’s based in Michigan but travels to plants around the country to work on ABB’s multimillion-dollar robotics systems. He says he “found his career niche” in Illinois State’s robotics lab, which exposed him to both sides of robotics—the machine, and the underlying Programmable Logic Controller (PLC) that makes it work. Even more so, he credits faculty members Kevin Devine and Dave Kennell with the kind of hands-on, problem-solving robotics instruction that prepared him well for his job at ABB. Illinois State’s Caterpillar Integrated Manufacturing Laboratory in Turner Hall. But back in September, he had to figure out a new problem—how to get a robot to dance in lockstep with Freelusion on America’s Got Talent. The dance group approached ABB about developing a robot-driven routine for the reality show’s live semifinal round, and Siwicki was tapped for the job. The robot, under Andrew’s pre-programmed control, moved in perfect sync with the dancers, video content, and other visuals. But it wasn’t easy. Dancers often change their routine throughout the rehearsal process, and Siwicki found himself making unrehearsed tweaks right up until showtime. While Siwicki’s TV gig may be unusual, his employability and career path are not, says Branoff.